June saw me back in California for another two week work trip in Silicon Valley, and again stuck out there over the weekend with nowt to do – what a drag. The last couple of trips I had rented a Harley Davidson’s, Dyna 103 Low Rider and a Road King, so this time I wanted to try something a bit different which I could fling around the bends without grinding foot boards. 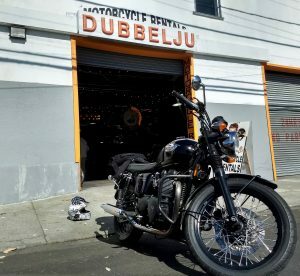 This is when I found Dubbelju (pronounced double-you), who are also based in the Mission district of San Francisco, but offer a much wider selection of bikes, from adventure and touring to custom, cafe racers and street bikes. Read on for the full low down on my bike rental in San Francisco. Due to my work trip being finalised quite last minute, I was a little at the mercy as to what bikes hadn’t already been booked, so unfortunately my first choices of big adventure bikes like the Honda Africa Twin, KTM 1090 and BMW 1200GS were gone. The Yamaha FJ-09 (Tracer 900) was tempting to try as a logical step up from my Fazer 600 I ride in London, but for a blast in the sun I wanted something different with more character that I wouldn’t normally choose to ride. So, I opted for the Triumph Bonneville T100. Sure their Thruxton was tempting, but the practicalities of comfort for a long weekend riding won over. Having rented in the past from EagleRider, I can’t help but compare the two companies side by side. The online booking for on Dubbelju’s website may not be quite as polished as EagleRider’s, but I received a much more personal service afterwards as Dubbelju’s staff followed up with details, ensured everything was clear and offered plenty of help to plan my days on the bike. From recommended routes and destinations to mundane stuff like pointing me to a good local car park to dump my rental car for the weekend (San Fran Mission District has a bit of a sketchy ambience). Both past rentals at EagleRider and this rental from Dubbelju have all gone very smoothly. Once EagleRider gave me a free upgrade due to my first choice of Harley being unavailable, otherwise my bikes have been ready and in good shape to ride away. Both companies work you through the paperwork quickly and gave thorough introductions to the bikes, their controls, supplied security etc. All the bikes I’ve rented have run perfectly, no breakdowns or punctures, but Dubbelju’s included breakdown cover is good piece of mind. One up for EagleRider is their Sunday opening, which is key if you only have a weekend spare on a work trip. Dubbelju normally only offer a Sunday drop off at associate car park a couple of miles North of their office, with a $50 surcharge. That said, when I rented, one of their mechanics was planning to be in their main office briefly on Sunday evening, so I did manage to drop off there and save some cash. Though I don’t believe this is the norm. EagleRider’s other big advantage is the sheer number of locations they have, perfect for a long point to point adventure. 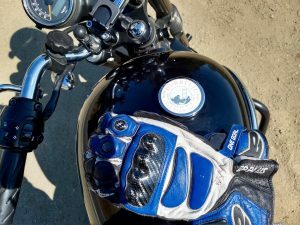 Fancy doing coast to coast on Route 66 or following in Robert M. Pirsig’s tracks? Where Dubbelju win over EagleRider is the choice of bikes. EagleRider mostly rent Harley’s, Indian’s and similar big cruisers, with only a couple of locations offering adventure or street style bikes from the likes of BMW, Honda or Ducati. My last two visits to San Francisco have also coincided with weekends the EagleRider BMW & Honda San Fran location has been shut. 🙁 Dubbelju on the other hand have bikes from BMW, Ducati, Harley Davidson, Honda, Kawasaki, KTM, Suzuki, Triumph and Yamaha. If you’re after something classic, cafe racer or custom in style, Dubbelju are your only choice. From a practical view, EagleRider include soft saddlebag or built in hard luggage on their Harley’s; Dubbelju offer similar where they can be fitted depending on bikes, but do offer top boxes and tank bags to rent too. Kit wise, EagleRider include free rental of a piss-pot half lid, but do have proper helmets and jackets for a small charge (though only three full face lids one time I rented!). Dubbelju can rent you a full set of kit – lid, jacket, trousers and gloves. Though, for my flight over it was no hassle to pack boots, gloves and kevlar jeans in my suitcase and take my jacket and lid hand luggage, avoiding any worries of ill fitting gear. The million dollar question is obviously, who has the most competitive prices? This isn’t the easiest to fathom due to the common US norm to not present a single simply figure, but pile on the extras, insurances, waivers, taxes, environmental fees etc. At time of writing, base prices for a Harley Davidson Sportster 1200 is $129/day at both, though a Honda Africa Twin is $189/day at Dubbelju vs $169/day at EagleRider and a BMW F800GS is $189/day at Dubbelju vs $159/day at EagleRider. However, Dubbelju include breakdown cover in their prices (an extra $10 at EagleRider). Both firms include the minimum third party insurance required, but both charge extra for damage & theft waiver cover – definitely recommended in case you drop the bike etc. 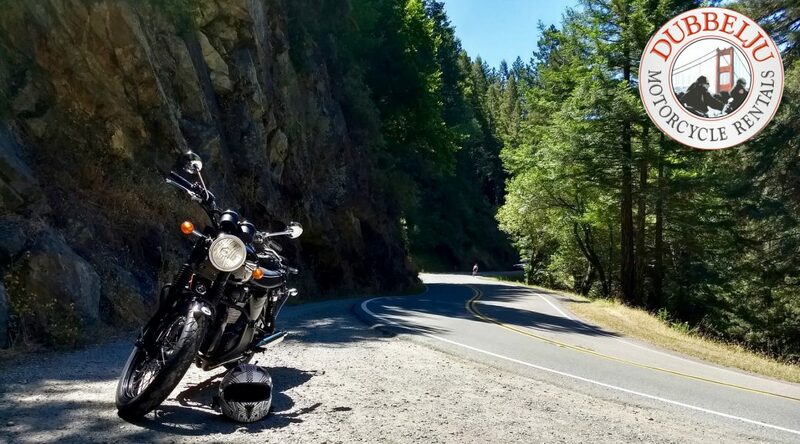 EagleRider win here with their VIP-ZERO cover at $35/day which offers $0 damage excess, $1k theft excess and bike rental deposit lowered to only $100. Dubbelju just offer Collision Damage Waiver II at $31/day with $1.5k damage excess and a lower $1.5k rental deposit required; theft cover is an extra $9/day with same $1.5k excess. Note: both also have cheaper options with higher excesses. So, after working through the figures, I’d say EagleRider are actually a little bit cheaper overall, but not by much. Both companies also often have many deals and discounts for stuff like weekday / off season rentals, early bird / repeat bookings etc, so do keep a look out for bargains! So there you have it, I found Dubbelju to offer a great service which I can highly recommend. There maybe some areas where EagleRider is better, for example if you want to tick off that long cross state trip on a big Hog; but Dubbelju have a unique selection of bikes on offer that are perfect for exploring the Californian roads and they offer a more personal service that comes from a smaller business that is run by bikers who want other bikers to really enjoy their ride. Check out Dubbelju’s website for more info and deals on bike rentals. 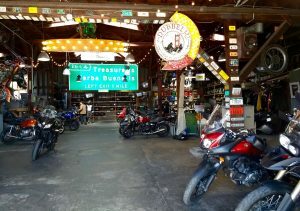 Watch my video highlights of my exploration of the San Francisco bay area on the Bonneville here.